I am ABC: American-born Chinese. 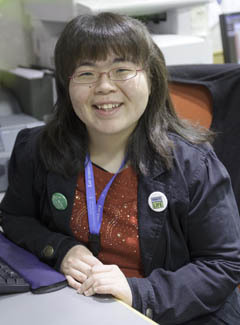 At birth I appeared healthy, so my parents—born in China—were shocked when I was diagnosed with chronic kidney failure at age three. Suddenly, they were forced to learn medical terms such as ‘organ donation,’ ‘dialysis,’ and ‘kidney transplant.’ The concepts were foreign and frightening to them, but they still underwent tests to see if they could donate a kidney to me. Unfortunately, neither was a match. In October 1985, I started peritoneal dialysis. On January 30, 1987, at age four and a half, I received my first kidney transplant at the Albert Einstein College of Medicine in the Bronx, NY. I do not remember my young childhood of procedures, needles, and dialysis treatments. For me, my memories and my life began after that first kidney transplant. I walked, talked, ate like never before, made friends, went to school, danced to 80s music with my older sister, and laughed with my parents. As I grew, however, the lifetime of immunosuppressant medications caused weight gain, uncontrollable bladder issues, and developmental concerns with my left hip and lumbar spine. When I was almost twelve, my family and I were told that my first transplanted kidney was failing, with only 10% function left. I was put on the national waiting list in February 1995 and prepped for hemodialysis. On May 5, 1995, I received my second kidney transplant at Westchester Medical Center in Valhalla, NY. My life was saved by the parents of a deceased four-year-old girl, who chose to donate her kidneys in their time of unimaginable grief. I vowed then that I was going to live my life to the fullest and help others as a tribute to the donor families of my two transplants. Now, after 21 successful years on my second kidney, I am an advocate and active member of the organ donation and transplant community through my writing, public speaking, and involvement with the Transplant Support Organization, New York Organ Donor Network, National Kidney Foundation, TRIO Youth Circle, Transplant Speakers International, and UKRO (University Kidney Research Organization). In every article I write, every registry drive I advocate for, and every event where I speak publicly about my life story, my organ donors and their families are always there. I think about them every day. In my personal life, I love swimming, baking, cooking, traveling, and spending precious time with my family and friends. As the primary chemo scheduler at Memorial-Sloan Kettering Cancer Center in Sleepy Hollow, NY, I work with a group of caring nurses, doctors, and administrative staff. Together, we provide optimal care to our patients. My incredible health journey has taught me that we are stronger than we imagine, we can connect with people who inspire and teach us, and, most of all, we must continue to enjoy this extraordinary ride of life rather than focus on our destination. 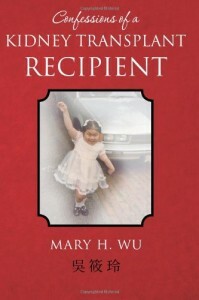 Mary Wu’s book, Confessions of a Kidney Transplant Recipient, is now available at Amazon.com. Please take a look and share her inspirational story with others.